Wealth is Multipurpose landing page template. 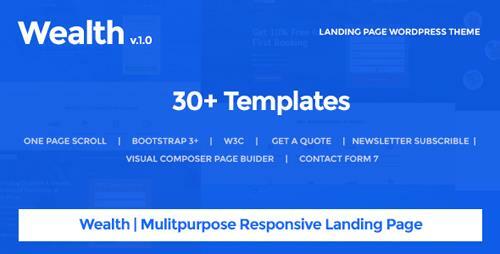 Template is responsive and built with visual composer drag and drop layout. Its suitable for medical & pharmaceutical, Skin Surgery, Online Dating, Weight Loss, Insurance, Law firm, cafe, restaurant, mortgage, fitness, car booking, Handyman, Car wash, Photography studio, Rental etc� All template has lead generation form. Wealth Bootstrap Landing page is modern and clean with suitable color. Built with technologies like HTML5, CSS3 and Bootstrap Front-End Framework.